Classic cool Cornerstone Roots continue their summer club tour with a performance at the Yot Club in Raglan on February 1st, 2013. After a busy winter of writing, rehearsals and targeted events, the band is looking forward to playing crowd favorites and new tunes off their fourth coming album this summer. Cornerstone Roots classic cool approach has seen them stay true to their inspiration, the colossal world of Jamaican reggae, while bringing a Pacific consciousness to their music. After three critically acclaimed albums and two EPs the band will release their fourth album in early 2013. Cornerstone Roots are soon to release their latest single and video Take Me that was filmed by Adventure Artists crew in Raglan at the beginning of December. Take Me is a soulful reggae groove with a simple commentary on spirit and guidance. After a decade of performances the current line up is seven strong with family members Brian Ruawai on vocals, Naomi Tuaopepe on bass guitar and their son Reiki Ruawai on vocals. The band also features Andre Peri on drums, Reti Hedley on samples and guitar, and Nick Stevens on keys and Aaron Bush on percussion. 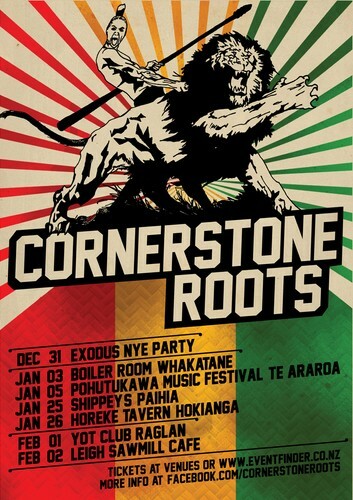 Cornerstone Roots will play 10 shows in NZ and 5 in Australia over the summer period.